Out on the East End of Long Island, in the tone hamlet of Quogue, you’ll find summer cottages just like this one. 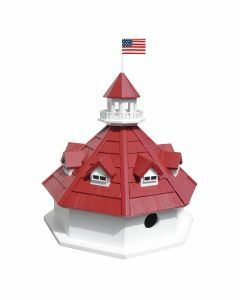 A great, big beautiful wraparound porch and a western red cedar shingled roof, including a turret, are the standout features of this new signature birdhouse. Three hanging flower baskets adorn the porch. There are two separate nest boxes separated by an interior wall. 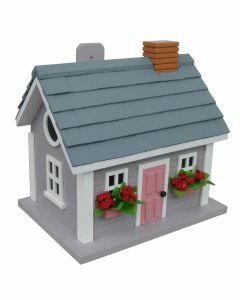 A removable back wall, drainage, ventilation, an unpainted interior and a 1.25” hole size will accommodate wrens, finches, chickadees, nuthatches and titmice. 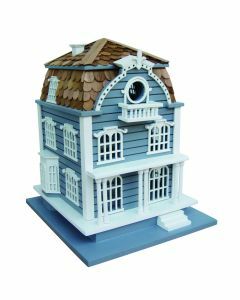 Item Dimensions: 12″ H X 16″ W X 12″ D. Click on image for greater detail.